My thoughts on The Book of Cthulhu: I'm really new to Cthulhu and H.P. Lovecraft. But I know what I love and I loved The Book of Cthulhu!! A friend introduced me to Lovecraft earlier this year and I started hunting for his books in used bookstores and at the library, so when I got the chance to read The Book of Cthulhu I couldn't wait to get started. And I was not disappointed on bit. There are twenty seven stories in this anthology and there's something here for everyone! Being so new to Lovecraft, I did some research and from what I've learned, Night Shade Books and editor Ross E. Lockhart have assembled some of the finest Lovecraftian stories out there. I learned that many are quite rare and have been around for a long time. I wish I was more of an expert on Lovecraft. But maybe this newbie can offer a fair review because I have no preference towards one author or another. I really enjoyed most all of the stories, they were well crafted with enough weirdness and off-kilter vestiges that I stayed pretty creeped out by them. A couple of the stories that really got to me were Gene Wolfe's Lord of the Land, with his truly icky alien possession and Ann K. Schwader's tale that brings in what I think of as Egyptian mythos. I love most all things Egyptian. I don't want to try to pretend to know the histories and the legends behind these entertaining authors. What I can say is that I enjoyed the read, each author brought something different and very entertaining to the anthology. I say try something new. 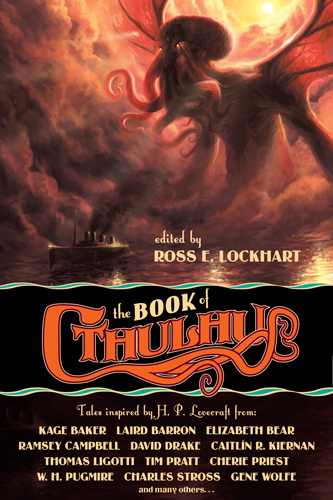 If you like to be weirded out, made to question your regular reading material, then for goodness sake...read The Book of Cthulhu, step out of your comfort zone and enjoy coloring outside the lines in these short stories. Who knows? You may find yourself on a search engine looking up Lovecraft!